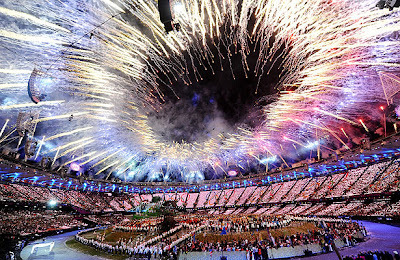 The 2012 Summer Olympics in London have officially begun! I am not entirely sure why I am so enthralled by these particular Olympic games, but I am sitting here on my couch (and may have been for a long time) still watching them. Note: it doesn't help that I attempted to go running at 130 this afternoon on a summer day in Utah. What am I thinking? I'm clearly not an olympic athlete. Shocking, I know. Than I progressed (digressed?) to a migraine. I am officially incapacitated, so the Olympics have been on all day. Either way...still completely enticed. My favorite sports to watch are volleyball, gymnastics and swimming (so, yea, basically all of the Olympics ha). I watched the entire Opening Ceremony last night, too. I'm not entirely sure what was happening. Was it just me or did anyone else feel like they were on drugs? It's London. They can do whatever they want. @sierraainge: This opening ceremony only reminds how much I want to go to London. @sierraainge: Is this opening ceremony real? or am I on drugs? @sierraainge: "Despite all the tension that may be happening between countries, the smiles on each of these olympian faces are genuine." And then, I watched this absolutely incredible interview. Normally, I try to stay away from politics on this blog. I was raised in a family that got heated over politics--well, we got heated over most things, really--so I try to stay clear. But this interview with Mitt and Ann Romney is quite phonomenal. I don't care whether you're Republican, Democrat, Purple, White or Rainbow (yea, just go with it. you get my point), just watch this. "When you attack success, you have less of it." "Defining people on who has money and who doesn't is not the American way." "She (ann) is the only woman I have ever love. Truly loved. I love her, but she is my hero. Not in just her physical battles, but because she raised 5 sons, too. And not just 5 sons, but MY 5 sons!" Okay, let's get these competitive juices flowing!!! Anyone else love the Olympics as much as I do? Or am I still a huge, fat nerd? The opening ceremony was so bizarre, very British and absolutely bonkers, it made me proud to be English though.....I have been wondering what people overseas made of it. I heard that NBC cut out the tribute to those that died in the 7/7 terrorist attack for a Ryan Seacrest interview, which I have to admit I found pretty appalling. I watched a bit of the swimming today, but haven't seen much other than that, I may watch a bit tomorrow. It's the Paralympic swimming I really want to see as I know someone competing. What a cute blog! I am returning the follow! Thank you so much for your kind words and stopping by Naptime Review. I can't wait for President Romney to take office. The man was born to lead a country. Our country. Such a class act. The media tries to pull things out of the closet on him, but the thing is, he doesn't have anything in the closet! They rip on him for being wealthy - since when was it a crime to be good at what you do and successful? The man is a plumber for leaky corporations. He goes in there and takes what is broken, turns it around, and makes it profitable. If anyone is qualified and able to fix the mess this country has become in the last 3.7 years, it's him. Also, I have not seen any of the Olympics. Not sure how that has happened but it's true. I'm going to blame it on not having a DVR. I love the Olympics too! I felt like I needed to be high before watching the opening too, but hey the firework show at the end was fabulous! I hope your migrane is gone! Not at all related to your post (I haven't seen ANY of the olympics yet, but I hope to see some of the tennis matches), but what a SWEET blog! I found it from the comment you left on mine, and I absolutely love it :) Keep up the good work! Excited to be your newest follower. HERE IS MY BACHELORETTE POST. I'm Pretty Sure This Was Written About Me. I Just Can't Do It Today. And this is why I started this blog. Oregon & a July 4th Holiday!